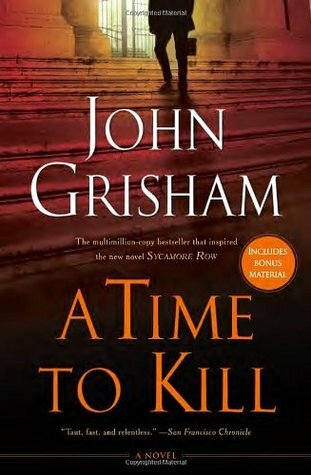 A Time to Kill by John Grisham – It's Time to Read! The life of a ten-year-old girl is shattered by two drunken and remorseless young men. The mostly white town reacts with shock and horror at the inhuman crime. Until her black father acquires an assault rifle and takes matters into his hands. For ten days, as burning crosses and the crack of sniper fire spread through the streets of Clanton, the nation sits spellbound as young defense attorney Jake Brigance struggles to save his client’s life…and then his own. I have read a few novels by John Grisham and have enjoyed all of them. This is the first novel Grisham wrote, back in 1989. This is also the first book in the Jake Brigance series. The second novel is Sycamore Row, which was published in 2013. It is hard to summarise this novel without giving too much away. The opening chapter was a tough read – two drunk white men get their hands on a ten-year-old black girl and have their way with her in the most awful way. She is left to die, but once found and cared for, she is able to identify her attackers. They are taken to court, where on their back to their transportation, they meet her father, who is armed. The rest of this novel follows Jake Brigance, who is tasked with trying to save the father from the ultimate punishment – the death sentence – in a district were racism is still rife. He also has to try and protect himself, as the Klan are keen to see the end of the white lawyer who defends a black man. This wasn’t a quick read, and there was a lot of legal jargon I didn’t even try to follow, but this is probably one of the best books I have read this year. The first few chapters were horrendous to read – what happened to that girl was awful beyond words. I found it quite difficult to read, and it unsettled me every time we were reminded what happened to her. Once we were past the opening though, I found myself gripped. I’m not sure “enjoy” is the right word, but in want of another word, I did enjoy this book. I found myself in a moral dilemma. The father needed to pay for his crime, but he was avenging his daughter. I couldn’t decide if I wanted him sent to jail or let off completely. The jurors has the same problem, and I’m still not sure I am pleased with the outcome. I wasn’t really bothered by the main character, Jake, but I don’t feel that this was a novel where my opinion of the characters mattered. Some of them were entertaining, some of them I disliked, but that didn’t make or break the story for me. The focus of the book was the trial, not whether I liked Jake or the decisions he made in his personal life. This is a story that is hard for me to comprehend. Growing up and living in England, I have very limited experience for racism, especially not on the scale of the American white/black divide. It was eye-opening and shocking to see the depths that this racism extends. This novel isn’t that old, and yet the Ku Klux Klan feature heavily in the story, terrorising any white person who associates with a black person. I am just shocked that this behaviour, these attitudes exist in any form in the world today. Like I said, this is one of the best books I have read this year. It isn’t for the faint-hearted – the opening chapters are truly awful, and really upsetting; but once past that, this is an excellent read. It is well written, there is suspense and drama. There was a load of legal stuff I didn’t understand, but that didn’t spoil the story. This is a great legal thriller, with the ultimate twist: what happens to the Dad? I am rating this book 4 out of 5, and would highly recommend it. I am looking forward to reading Sycamore Row, the second in the Jake Brigance series.